This new Airmate-USB model has 6 balanced mic inputs (+48 phantom is standard) with insert, 12 stereo line inputs, 2x USB and 2x Telephone Hybrids. Channel 5 and 6 have Mic/Line and USB interface to transfer audio from and to your PC. Channel 7 and 8 have, apart from the stereo line input, also RJ-11 connectors to interface with a POT (Plain Old Telephone) line and a Telephone appliance to dial the number you want to reach. High quality built in Hybrids with R (trimmer on the surface) and C balance (switch on the surface) and direct Connection and Talkback buttons in the Hybrid channels makes a conversation with listeners very easy. With the Telco Send (level to the caller) and Telco Gain (level coming from the caller) all levels can be easy adjusted. But be always aware of the fact that the RC balance has to be adjusted once to create a clean telephone signal send and receive. The manual will give info about this pretty simple procedure. The front panel ON switch is wired in series with the built in mechanical fader start enabling selection of start either by fader or hard start via the ON switch. 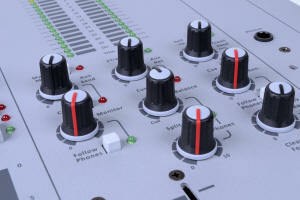 Faderstart generates in the Mic mode a Mic-on sig­nalling to switch on ON-Air lights. There is a 3 band Equalizer on channel 1-6. The stereo Aux send can be set pre or post fader. All mic inputs have low cut jumpers. A clean feed send is available for external Hybrids. The Airmate-USB has the usual master controls such as stereo master faders, stereo Aux send and return, monitor master with "follow phones" and a phones output with a split control function. There is a balance control to continuously adjust the volume between main output and stereo Cue signal. In addition, there is a special Radio On-air/production section featuring; Self­op switching to automatically cut control room level when the D.J. mic is active; a Clean feed output to also drive an external Telephone Hybrid for talk shows and interviews, if you need more Hybrid channels than the 2 built in ones; a special announcer output that normally follows main output but can be switched so that the main output, or any cue signal that is selected, can be heard when in the "follow phones" mode. A large Talkback switch activates the built-in electret talkback microphone for easy communication with the Clean-feed output, Aux output and/or Announcer output. The Airmate-USB is designed to be the focal point for local radio production work in the studio or at home. It’s compre­hensive, yet understandable features make it the ideal companion for rapid on-the-spot radio programmes. Small, reliable and 19" rack mounting ideal for production rooms. 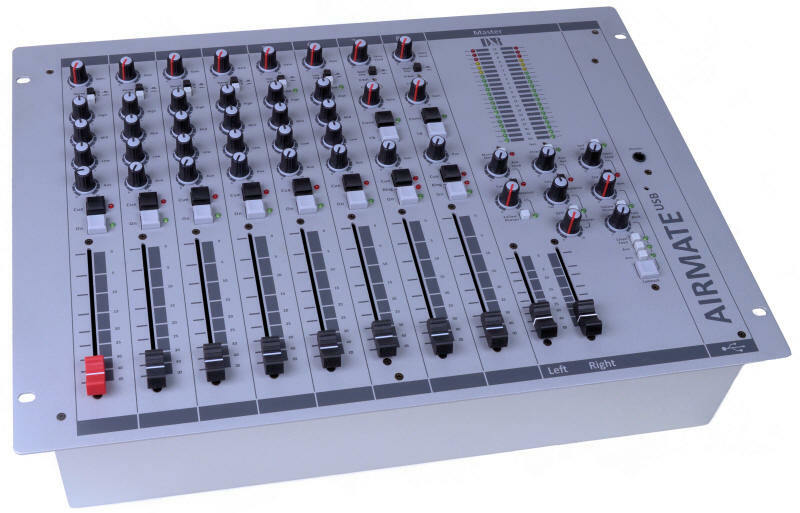 It can also double as an On-Air mixer or implemented in your own Internet Radio station. If your budget is tight, it never becomes obsolete as it can revert to production use, if, at a later date you fit in a larger On-Air mixer.